Edgar Allan Poe was a famous 19th-century writer who is still popular. He created the detective-story genre and wrote poems with interesting rhythms (like "The Raven"). The tale of his own disappearance, followed soon thereafter by his death, remains a “cold case” in literary history. Poe’s short story about a murderer, who kills an old man because he doesn’t like his “vulture” eye, is a classic of conscience-haunting. Is it the still-beating heart of the dead man—or—the pounding of the murderer’s own heart which forces his confession? That he chose an 1838 poem by Longfellow—a poet whose work Poe publicly criticized as smacking of plagiarism (a form of cheating which Poe had despised since childhood)—is telling. Perhaps this stanza of “A Psalm of Life” reflects the imagery Poe wanted to convey of a heart still beating after death? The narrator of this story—who is unnamed—does his best to convince readers that he is sane. Would a sane person take these actions? Would a sane person kill the old man just because he doesn’t like the old man’s eye? Whose fear is more palpable in the story—the old man's or the murderer's? 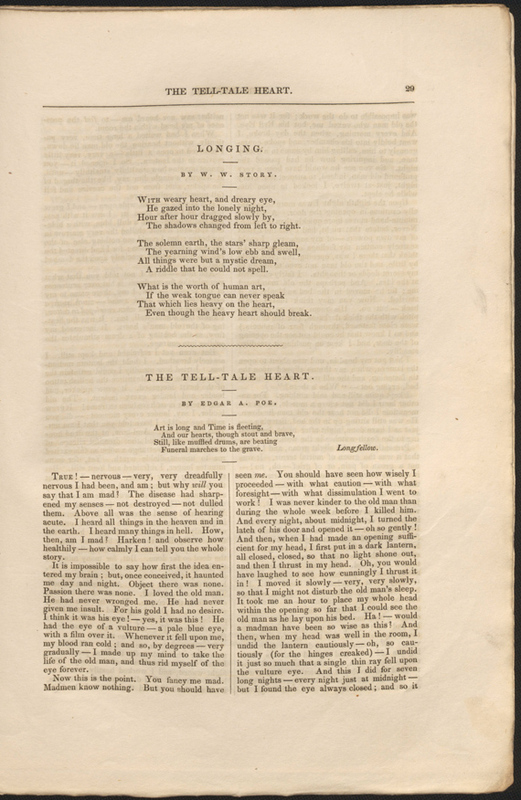 You decide as you read this abridged version of Poe’s classic tale (which he originally published in the January 1843 issue of The Pioneer: A Literary and Critical Magazine, Volume I, Number I). True! Nervous—very, very dreadfully nervous I had been and am! But why will you say that I am mad? The disease had sharpened my senses—not destroyed—not dulled—them. Above all was the sense of hearing. I heard all things in the heaven and in the earth. I heard many things in the underworld. How, then, am I mad? Observe how healthily—how calmly I can tell you the whole story. It is impossible to say how first the idea entered my brain; but once conceived, it haunted me day and night. I loved the old man. He had never wronged me. He had never given me insult. For his gold I had no desire. I think it was his eye! Yes, it was this! He had the eye of a bird, a vulture—a pale blue eye, with a film over it. Whenever it fell on me, my blood ran cold; and so—very gradually—I made up my mind to take the life of the old man, and free myself of the eye forever. Now this is the point. You think me mad. Madmen know nothing. But you should have seen me. You should have seen how wisely and carefully I went to work! I was never kinder to the old man than during the whole week before I killed him. 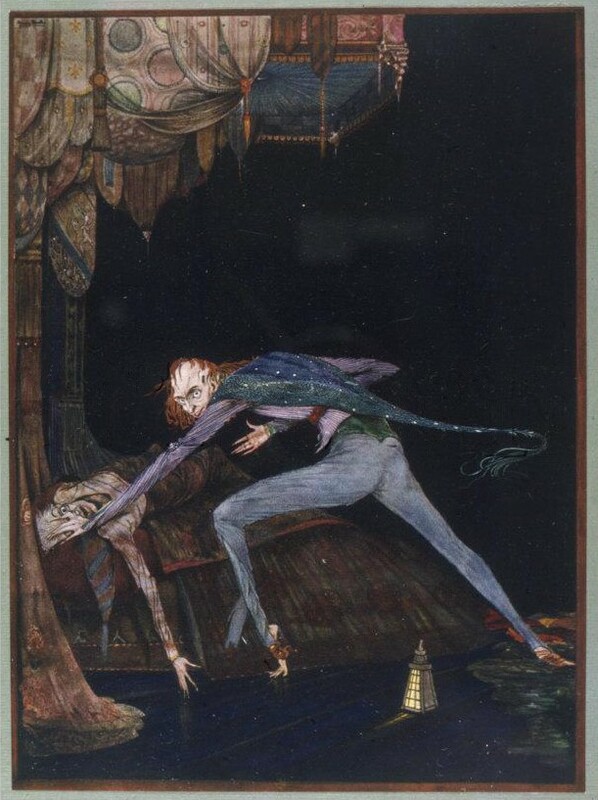 And every night, about midnight, I turned the lock of his door and opened it—oh, so gently! And then, when I had made an opening big-enough for my head, I put in a dark lantern—all closed, closed, so that no light shone out, and then I stuck in my head. I moved it slowly—very, very slowly, so that I might not disturb the old man's sleep. And then, when my head was well in the room, I undid the lantern cautiously—oh so cautiously—cautiously (for the hinges creaked). I undid it just so much that a single thin ray of light fell upon the vulture eye. And this I did for seven long nights—but I found the eye always closed; and so it was impossible to do the work; for it was not the old man who vexed me, but his Evil Eye. On the eighth night, I was more than usually cautious in opening the door. I had my head in and was about to open the lantern, when my thumb slipped upon the tin fastening. The old man sat up in bed, crying out "Who's there?" I kept still and said nothing. For a whole hour I did not move a muscle. During that time, I did not hear him lie down. He was still sitting up in the bed listening—just as I have done, night after night. Then I heard a slight groan, and I knew it was the groan of human terror. It was the low sound that arises from the bottom of the soul. I knew the sound well. Many a night, late at night, when all the world slept, it has welled up from deep within my own chest. I say I knew it well. When I had waited a long time, without hearing him lie down, I decided to open a little—a very, very little—crack in the lantern. So I opened it. You cannot imagine how carefully, carefully. Finally, a single ray of light shot from out and fell full upon the vulture eye. It was open—wide, wide open—and I grew furious as I gazed at it. 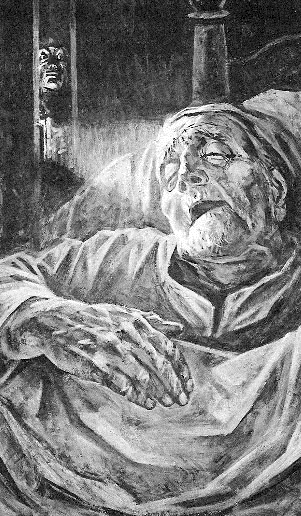 I saw it clearly—all a dull blue, with a horrible veil over it that chilled my bones; but I could see nothing else of the old man's face or person. For I had directed the light exactly upon the ... spot. And have I not told you that what you mistake for madness is but a kind of over-sensitivity? Now, there came to my ears a low, dull, quick sound, such as a watch makes when inside a piece of cotton. I knew that sound well, too. It was the beating of the old man's heart. It increased my anger. But even yet I kept still. I hardly breathed. I held the lantern motionless. I attempted to keep the ray of light upon the eye. But the beating of the heart increased. It grew quicker and quicker, and louder and louder every second. The old man's terror must have been extreme! The beating grew louder, I say, louder every moment! And now a new fear seized me—the sound would be heard by a neighbor! The old man's hour had come! With a loud shout, I threw open the lantern and burst into the room. He cried once—once only. Without delay, I forced him to the floor, and pulled the heavy bed over him. I then smiled, to find the action so far done. I then took up three pieces of wood from the flooring, and placed his body parts under the room. I then replaced the wooden boards so well that no human eye—not even his—could have seen anything wrong. There was nothing to wash out—no mark of any kind—no blood whatever. I had been too smart for that. A tub had caught all—ha! ha! When I had made an end of these labors, it was four o'clock in the morning. As a clock sounded the hour, there came a noise at the street door. I went down to open it with a light heart—for what had I now to fear? There entered three men, who said they were officers of the police. A cry had been heard by a neighbor during the night; suspicion of a crime had been aroused; information had been given at the police office, and the officers had been sent to search the building. I smiled—for what had I to fear? The cry, I said, was my own in a dream. The old man, I said, was not in the country. I took my visitors all over the house. I told them to search—search well. I led them, at length, to his room. I brought chairs there, and told them to rest. I placed my own seat upon the very place under which lay the body of the victim. I talked more and with a heightened voice. Yet the sound increased—and what could I do? It was a low, dull, quick sound like a watch makes when inside a piece of cotton. I had trouble breathing -- and yet the officers heard it not. I talked more quickly—more loudly; but the noise increased. I stood up and argued about silly things, in a high voice and with violent hand movements. But the noise kept increasing. Why would they not be gone? I walked across the floor with heavy steps, as if excited to anger by the observations of the men—but the noise increased. What could I do? I swung my chair and moved it upon the floor, but the noise continually increased. It grew louder—louder—louder! And still the men talked pleasantly, and smiled. Was it possible they heard not? No, no! They heard! They suspected! They knew! They were making a joke of my horror! This I thought, and this I think. But anything was better than this pain! I could bear those smiles no longer! I felt that I must scream or die! And now—again! Louder! Louder! Louder! To experience the adapted story via animation, have a look at this Columbia Pictures video. It features the actor James Mason, as the narrator, and a very strong (and kind of scary) beating heart. How does the impact of seeing the story (the link takes you to a more-recent animation) differ from reading (or hearing) it? The image, at the top of this page, is by Arthur Rackham, a famous British illustrator from the late-19th/early-20th century. Click on it for a better view. Bos, Carole "The Tell Tale Heart by Edgar Allan Poe" AwesomeStories.com. Jan 21, 2016. Apr 23, 2019.